Summary NORM OF THE NORTH is an animated feature about a polar bear who has to save the Arctic from property developers. 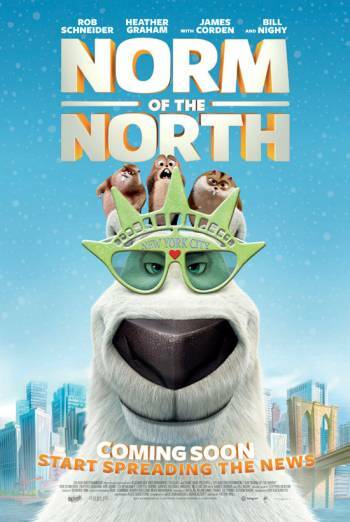 NORM OF THE NORTH is an animated feature about a polar bear who has to save the Arctic from property developers. Mild comic slapstick violence, such as a chase scene in which a man in a polar bear costume hits another man as he tries to escape, and a scene in which a baddie tries to shoot the hero with a tranquiliser dart but ends up shooting himself in the bottom instead. Very mild bad language includes 'Jesus', 'oh my gosh', 'heck' and 'god'. There is also some mild toilet humour, with references to 'number twos' and 'poop' and some comic farting noises. Some indestructible lemming characters often put themselves in danger, for example by biting into electrical cables to turn lights off. They are shown glowing as they are electrocuted, but recover immediately and it is emphasised throughout that they are special creatures that cannot be harmed like everyone else.